The JJC MT-636 Multi-Exposure Timer & Infrared Remote is a remote switch inbuilt self-timer, interval timer, multi-long exposure timer, and exposure-count setting features. 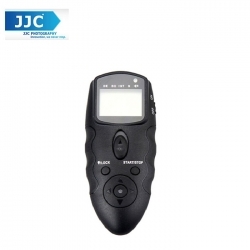 What’s more, this remote has inbuilt infrared code for CANON, NIKON, SONY, OLYMPUS, PENTAX, SAMSUNG cameras. It can trigger the camera either wired or wireless. So it is a good way to prevent camera shake, this is perfect for taking long exposure photos. The timer can be set anywhere from 1 second to 99 hours, 59 minutes, 59 seconds. A dial enables you easily enter the numeric settings with a single thumb. The LCD panel can also be illuminated. All these features make it good for time-lapse photography. - You can set the timer delays, multi-exposure times, and intervals up to 99 hours, 59 minutes, 59 seconds in one second increments. - MT-636 enables you to select anywhere from one to 999 continuous shots, or you can set the device to take an unlimited number of photos. - MT-636 enables you to set up to 9 different exposures time in one setting, let you can easy find out which is your best exposure time for your shooting. - The backlit LCD display panel gives you a visual reference so you can enable the following functions: self-timer, exposure, interval, and number of shots. It also act as a status indicator for battery life, timer functions, lock indicator, number of shots, and more. - MT-636 will give you an audible beep for the last three seconds of a countdown delay or interval. It will also beep to confirm your settings. The beep can be turned off if necessary. - Powered by two "AAA" batteries, it can last for about 2 months.